Yearling sales are only three months away – the catalogue is already out. Why not use the sales as a way to test your skills and breeding theories? Can you be as clever as Cran Dalgety, as good as Geoffrey Small or as magic as Mark Purdon in finding the nuggets of gold amongst the hundreds of hopefuls? This is a great time to test your ability to pick future winners based on their pedigree, family performance and individual type. By yourself, or with a group of friends, select your own ‘virtual stable’ of yearlings and follow their careers. There’s no need to waste sellers’ time with inspections – just use what is publicly available such as the catalogue, further pedigree databases if you want, the videos and photos, and the yearlings themselves on Parade Day and as they go through the ring. You can make up the rules to suit yourselves, but the key is to keep it simple and avoid long lists that get altered as the reality of racing starts to kick in. The best option is about 6 yearlings each. You can use a budget limit, or just pick without regard for the yearling’s price on the day. It works best if the decision deadline is on Sales Day or soon after. Follow your sales picks over the next few seasons, and see what happens. At the end of each season, there might be a “shout” by the loser or a TAB voucher for the winner, or whatever suits your pocket and the number of people involved. You might judge success on number of “virtual stable” wins, or the horse with the highest earnings – or for their 2yo season just qualifying is worth celebrating. Because this is a lot harder than it seems! I first tried this with a friend at the Sale of the Stars 2009. We each picked three yearlings from the North Island (Australasian Classic) Sale, and three yearlings from the South Island (Premier) Sale. Our six selections had to be split between colts and fillies. Of the total 12 yearlings we picked between us, only one has (halfway through their 4yo season) earned more than its purchase price. Three of our fillies never qualified but are at stud already. I was fortunate to pick Charge Forward for my stable, the lovely Grinfromeartoear-Pure Envy colt who cost $30,000 and has so far earned $82,082 with 7 wins. My next best was (by coincidence) another colt bought by the ATC Syndicate – McArmbro, cost $36,000 and ended up with 17 starts for no wins and 8 places and only $5276, before going to Australia and adding 7 wins for a lifetime earning total of $28,301 to date. My friend’s best pick was Return of the King (Christian Cullen-Hot Blooded Woman) who cost $41,000 and was exported immediately to Australia where he’s managed 6 wins and 20 places for a total of $31,446 to date. Another of her selections was Meet Me In Seattle which looked very promising but then his form tapered off with only $9,674 in the bank so far. I have a huge respect for those who buy astutely and successfully at yearling sales! I certainly found selecting from the catalogue (on pedigree and family performance alone) was a disadvantage for the South Island sale, as I could neither get there in person or watch it on TV. I can understand why buyers/trainers place a premium on type. and Lot 179 Sugar Ray Brogden (Grinfromeartoear-Swift Mirage). Lot 27 Assasin – (Art Major – Almost an Angel). So far we have two qualifiers (Mexicano and Sugar Ray Brogden) and Mexicano has tasted success at the races. 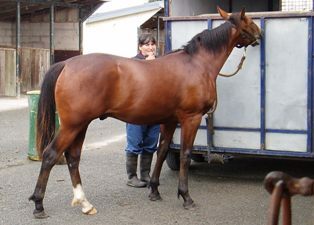 Developing a good eye for a nice horse, good families and potentially successful pedigree matches takes time. The yearling sales are a wonderful opportunity for any of us to observe some of the better bred horses in the flesh and to compare types. So come on, start your homework now, and I’ll come back to this topic closer to the 2012 yearling sales and compare notes. Can you pick a champion? 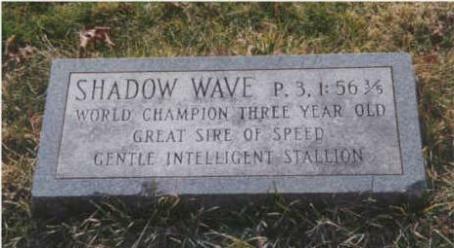 I want to sing the praises of pacing stallion Shadow Wave, born 1955 and died 18 years later. “Gentle and intelligent” – those words tell us a lot about the horse, and the love and respect he had from those who managed him. Shadow Wave was a son of Adios. He was unraced as a 2yo but went on to be a top performer at 3yo – the winner 20 races including The Little Brown Jug and named World Champion. He left plenty of good, fast horses, but no sires that carried on his line, which is how sires are judged. However his legacy really comes as a damsire and as a source of quality genes that, given the right conditions, can carry his influence over an extended number of generations. He’s not Mr Fixit. But he is a strong integral part of a lovely fair-isle knitting pattern of breeding I am trying to create (I say “try” because there are no instant guarantees, given the nature of nature). He is a strong coloured yarn held behind the pattern and ready to be introduced to make an impact. Hang onto your knitting needles! Shadow Wave’s strong white blaze is unusual in top sires, and distinctive white face markings pop up in some of his top progeny and their descendants. Is this a sign of the strength of his influence, sometimes over several generations? Take a look at these sires and offspring who have become part of the outstanding Zenover family and its different branches in recent times – they all have Shadow Wave genes – speed and strength. This family really appreciates Shadow Wave – and the feeling is mutual. 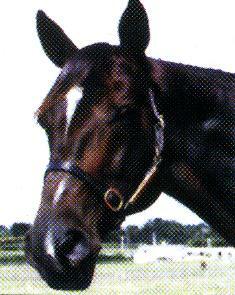 New York Motoring (sire of Interchange and Zenola Star) Shadow Wave is his damsire. Payson’s Brother (mated with Interchange and grandsire of Copper Beach) Shadow Wave link through the sire line of No Nukes. Elsu (son of Interchange). New York Motoring is his damsire. Destination Moon (Grinfromeartoear son of Zenterfold). 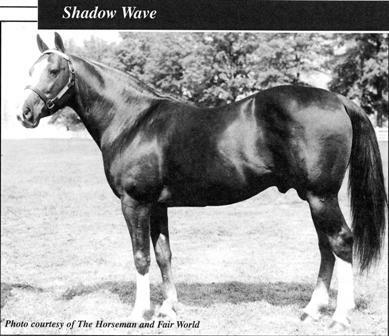 Shadow Wave appears twice in his pedigree, once in his sire’s and once – via New York Motoring – in his dam’s. Just to highlight Shadow Wave’s influence on the world-wide stage, amongst his filly foals were Dottie Shadow (dam of Oil Burner, $535,541), Tiny Wave (dam of Big Towner, $547,126), Ingenue (dam of Falcon Almahurst, $400,776), Real Hilarious (grandam of Die Laughing ($2,164,386) and also of Go for Grins ($302,003)), and Resourceful (grandam of Armbro Operative ($1,012,712). Shadow Wave is also the sire of Peaches N Cream, who is the dam of New York Motoring ($230,492) and Happy Motoring ($538.495), two well performed brothers by Most Happy Fella who are influential as sires and damsires in their own right. 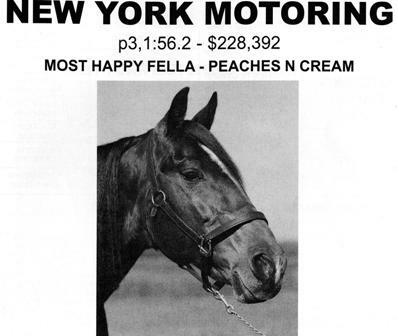 Happy Motoring pops up as the sire of On the Road Again ($2,819,102), and the grand-damsire of Pacific Rocket ($2,333,401). New York Motoring is the damsire of Elsu ($2,083,352), and the grand-damsire of Tintin in America ($934, 305). Of course Oil Burner turned out to be the sire of No Nukes, and so brought Shadow Wave’s influence into many modern pedigrees. New York Motoring was a prominent sire in New Zealand through the 1990s and therefore Shadow Wave is included in many mares’ pedigrees in New Zealand. Shadow Wave’s appearance in the pedigrees of Panorama and Safely Kept means he is also poking his white-blazed nose into many quality Australian pedigrees as well. 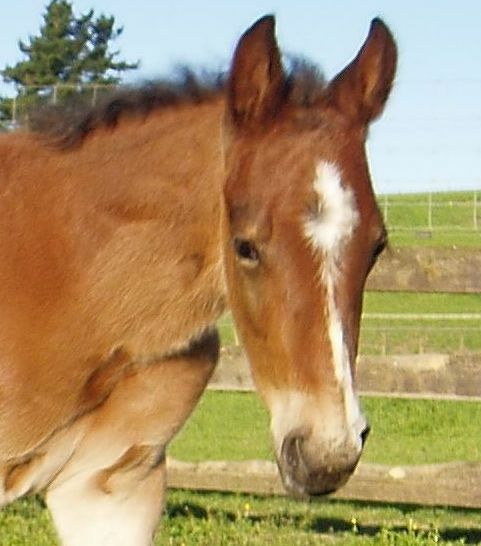 More recently, Shadow Wave has appeared though Shifting Sands and Blue Horizon and Tiny Wave in the maternal lines of sires available in New Zealand, Australia and North America – Real Desire, Red River Hanover, Mach Three and of course Grinformeartoear. New sires with double ups of Shadow Wave include Artistic Fella and Shadow Play. You can see from all these sires that the white face and sock markings are often not present, but having Shadow Wave in the background may mean they pop up in some of these sires’ progeny in a “where on earth did that come from?” moment. So while Shadow Wave may not have ‘created waves’ as a sire of sires, he has been – and is still – a very positive influence in the pedigrees of many horses today. He is one of those sires whose genes seem to “punch above their weight” and blend well with other influential (not necessarily the most obvious or modern) genes. He was known for working well with mares of his time from trotting lines. He seems to love finding his own sire Adios and some of the great old bloodlines that New Zealand breeders access through Tar Heel, Albatross, Good Time and others. I don’t believe in double ups for their own sake, but Shadow Wave is a sire who thrives on meeting himself in a pedigree, and can influence through maternal and sire lines equally. If he’s there, he adds value. And this can be reinforced by breeding choices. Those white markings are a lovely reminder of the continuing influence of this gentle and intelligent stallion. A recent article in Breeding Matters, the magazine of the New Zealand Standardbred Breeders Assn, talks about the skills and understanding that Kym Kearns brings to her work with horses. I’ve reproduced that article so more people can get to read it. I’m lucky to have Kym’s involvement in raising and preparing the horses I breed. I see first hand the added value I get from this. reasoning, as a teenager, was that she was familiar with where he lived, his paddock, his home. So she wanted to reciprocate and give him a look at where she lived. It’s an insight into the mutual respect she builds with a horse that enabled them both to walk such a risky line! Much later, 2006 it would be, I watched her walking yearling Tintin in America around the Cambridge Raceway and quietly letting him inspect and get familiar with all the surroundings, including the “trainers tote” box where in future many dollars were passed over the counter and placed on Tintin the very successful racehorse! Kym has the patience to build a horse’s confidence within clear boundaries. Their curiosity is all part of their mental development, and her curiosity about what makes them tick, individually, helps her ‘read’ a horse and develop its character and potential. That lays a foundation that asute trainers can – and do – build on.